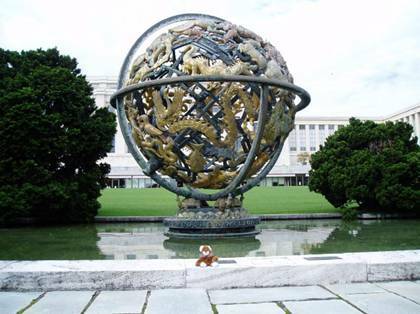 My adventure began on a warm August afternoon, in the United Nations gift shop in Geneva. In July, after graduating from Bear School, I had moved to a comfortable shelf near the front of the gift shop. This was an ideal location, providing an excellent view of all the people coming in to do their shopping. I have always been fascinated with people, so I found it very interesting to watch them. But the best part was in the evening. Once all the people had gone home, I was able to wander about the store, playing with the toys, and visiting with all the other stuffed animals. There were many different animals - tigers, elephants, and even dolphins! Unlike some of the Bears, who only liked talking to other Bears, I enjoyed visiting with all of the animals. It was an ideal situation, and I was getting very comfortable. At first, when the human picked me up, I was a bit frightened. It seems strange to think about it now, after all the time I have spent with humans, but at that time I had never been picked up by a human before. But I quickly relaxed, once it became clear he was not going to try to hurt me. We Bears are tough anyway. I was confident that I could take care of myself. Before I realized what was happening, he took me to the cashier, gave her some money, and took me from the store. I had been bought. My first thought was that I would run away that night. I was no stranger to Geneva, having grown up, and gone to Bear School there. Once it was dark, the streets would be far safer for me than for him. So I stayed quiet and waited. 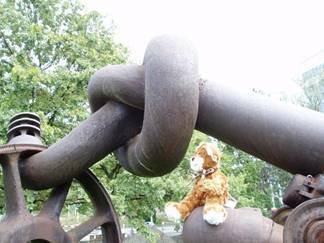 Then, to my amazement, the human started taking me around and showing me some of the famous sights of Geneva. I had seen many of them before, but never in the daytime. He took pictures too. Here is one of the very first pictures that he took. I am in front of the UN building in Geneva. This driveway is lined with the flags of all the countries in the United Nations. 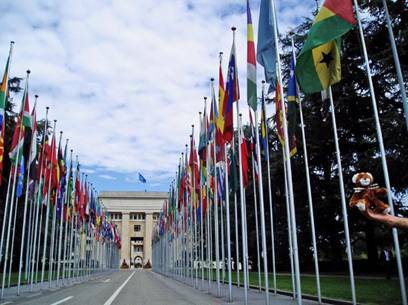 In all, there are 191 countries in the UN, and every one of them has a flag here. I soon realized that this human was not from Geneva, or even from Switzerland. He seemed to be interested in one particular flag, from a place called Canada. In Bear School, we had learned many useful things. We had studied how to find berries, how to catch salmon, and how to avoid humans. But we never learned anything about a place called Canada. I have always been a very curious bear. My mother always told me that it would get me in trouble one day. But this day, it didn’t get me into trouble. It started me on the greatest adventure that a bear could ever have! I had been planning to run away that night, but I started thinking about this place called Canada, and I wondered if the human planned to take me there. I wondered what it would be like, and if there would be interesting people and bears there. The more I thought about it, the more curious I became. In the end, my curiosity got the better of me, and I decided I just had to stay. And that is how my adventure began. 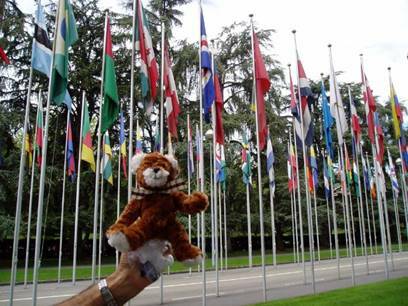 Before we went to Canada, the human gave me an extended tour of Geneva. I learned all sorts of interesting things. I had seen this globe many times, but only at night. When I saw it in the daylight, I was amazed to see all the gold. It is impressive even at night, but in the day it is awesome. As we toured Geneva, I realized that I was seeing the city in a whole new light. It was like I was discovering it anew. I realized that if I was having this much fun in Geneva, imagine the fun I would have in other cities. My traveling companion (I was already beginning to think of him in this way) also began to tell me stories about some of the things we were seeing. He told me that the gun I was sitting on had been a real gun used in the First World War. 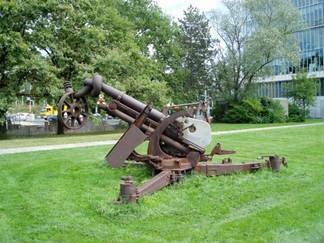 At the end of the war, they decided they did not want any more wars, so they tied the barrel of the gun into a knot. It is a really neat idea – I wish it had worked. After our sightseeing tour, we went out for a lovely dinner, and then back to the hotel. I had several chances to escape that evening, but by then I was firmly decided to go with my traveling companion, and see what the world could show me. It is a decision that I have not ever regretted. 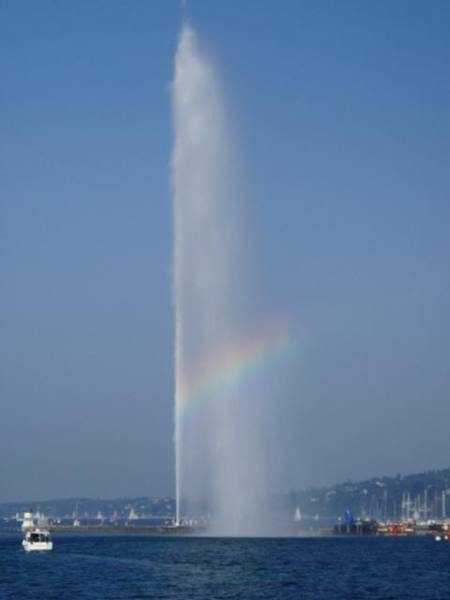 On my last day in Geneva, I saw something that I had never seen before – the jet d’eau, which is a giant water fountain. They turn it off late at night, so I had never seen it. I was amazed. I have looked it up, and the water goes 140 meters high, and is going 200 km/hr. That is twice as fast as a car on the highway, which is simply amazing. For the rest of the day I had a huge smile on my face. And then that night, my traveling companion began to pack his suitcase. I began to get excited, because I knew that the next morning I would have my first airplane ride. I would also have my first sight of this place called Canada.